This book is about protocol-oriented programming. When Apple announced Swift 2 at the World Wide Developers Conference (WWDC) in 2015, they also declared that Swift was the world's first protocol-oriented programming language. By its name, we may assume that protocol-oriented programming is all about the protocol, however, that would be a wrong assumption. Protocol-oriented programming is about so much more than just the protocol; it is actually a new way of not only writing applications but also how we think about programming. In the first four chapters, we take an in-depth look at each of the components of the protocol-oriented programming paradigm. These chapters are designed to give the reader a solid understanding of the different components of protocol-oriented programming, so he/she will understand how they can use these components in their applications. One of the biggest misconceptions about protocol-oriented programming is that it is just another name for object-oriented programming. In Chapter 5, Object-Oriented Programming and Chapter 6, Protocol-Oriented Programming we take on this myth by comparing protocol-oriented programming to object-oriented programming to see what is similar and what is different. We also discuss the advantages and disadvantages of both programming paradigms. The last two chapters are written to help the reader understand how they can design their application in a protocol-oriented programming way. Chapter 7, Adopting Design Patterns in Swift looks at how we can implement several design patterns in a protocol-oriented way and Chapter 8, Case Studies looks at three real-world case studies to reinforce everything previously discussed in the book. 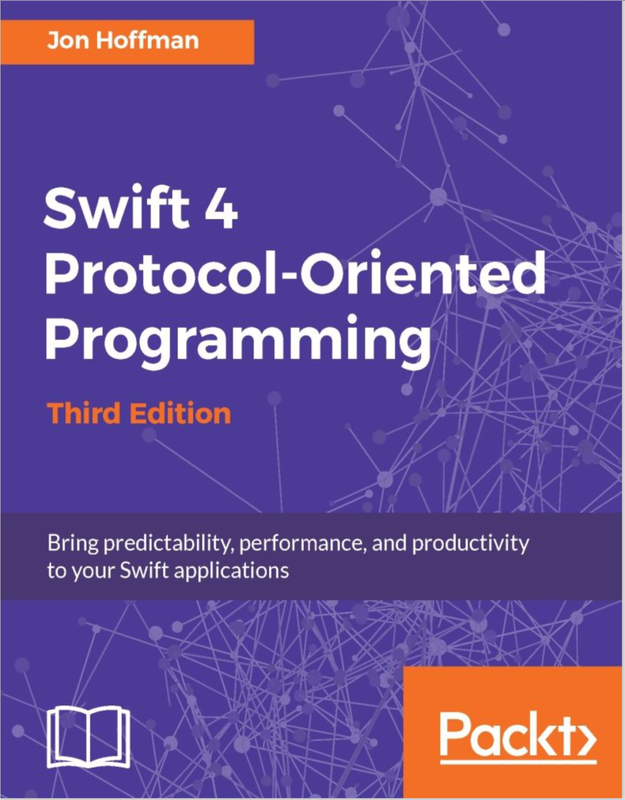 Chapter 1, Starting with the Protocol, looks at what protocols are and how they are used in the Swift programming language. We will also examine how the protocol can be used to write very flexible and reusable code. Chapter 2, Our Type Choices, discusses the different types that Swift offers (structs, classes, enums, and tuples). We will look at several examples of when to use the various types and when not too. Chapter 3, Extensions, looks at how extensions and protocol extensions are used with the Swift programming language. We will look at examples of how extensions can be used with protocol-oriented programming. Chapter 4, Generics, Apple has stated that Generics is one of the most powerful features of Swift and this chapter will show how powerful Generics is. We will look at how to use Generics to make very flexible types, and also how to implement the Copy-on-Write feature for our custom types. Chapter 5, Object-Oriented Programming, examines how we would develop characters for a video game, taking an object-oriented approach. In order to really appreciate the ideas behind protocol-oriented programming, we need to understand the problems it is designed to solve. We will then look at the drawbacks with this design. Chapter 6, Protocol-Oriented Programming, develops the same video game characters from chapter 5, but this time we will take a protocol-oriented approach to the design. We will then compare the object-oriented approach and the protocol-oriented approach to see the advantages that the protocol-oriented approach offers. Chapter 7, Adopting Design Patterns in Swift, looks at implementing several design patterns using protocol-oriented programming. For each of the design patterns, we will look at the problem they are designed to solve and how to implement the pattern. Chapter 8, Case Studies, explores two case studies. This chapter is designed to pull everything from the first six chapters together to show the reader how to use protocol-oriented programming in real-world situations.